GMAP for Windows 7 is a state of the art computer program which performs all processing and plotting tasks usually associated with the storage and presentation of palaeomagnetic pole positions, and generation of palaeogeographic reconstructions. 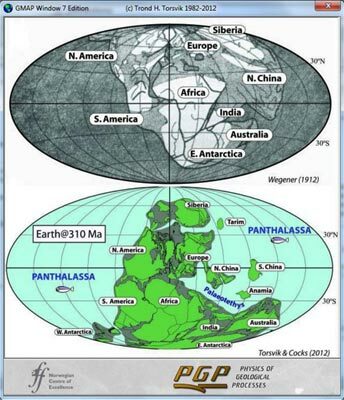 GMAP is menu-driven and easy to use; the user is never far removed from the basic data from which palaeogeographic reconstructions are derived, and therefore has a sense of total control over the program's performance. GMAP can generate reconstructions based on individual palaeomagnetic poles, averaged palaeomagnetic poles, and digitally derived smooth (APW) curves. Palaeogeographic reconstructions can be saved to disk files, and later viewed in chronological order as 'animations'. GMAP is supplied with a full range of continental outlines. It is also possible to import new continents via simple ASCII files or ARC GIS shape files. The GMAP software system package was originally developed by Torsvik at the University of Bergen (1982) and later with contributions from Lauri Pesonen and Mark A. Smethurst (Torsvik & Smethurst 1989), and Pavel V. Doubrovine. GMAP routines are currently being ported to GPlates (www.gplates.org) and this GMAP version is similar to earlier versions but can run under Windows 7 (older 16/32-bit Editions versions not compatible with Windows 7).